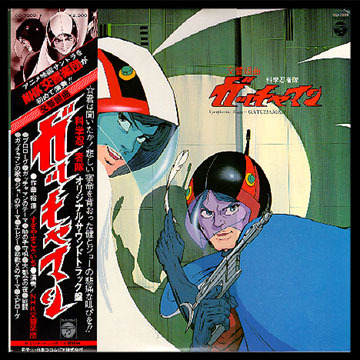 Contents: This was the Initial release of the score music from the Gatchaman feature film. It included a scored, intrumental version of the opening theme song (track 6). This LP was originally scheduled to be released with the stock number CQ-7042. Additionally, this LP was released on audio cassette (CAK-659, ¥2,300) and compsct disc (COCC-12585). Stereo. All selections performed by the NHK Symphony Orchestra. Conducted by Koichi Sugiyama.